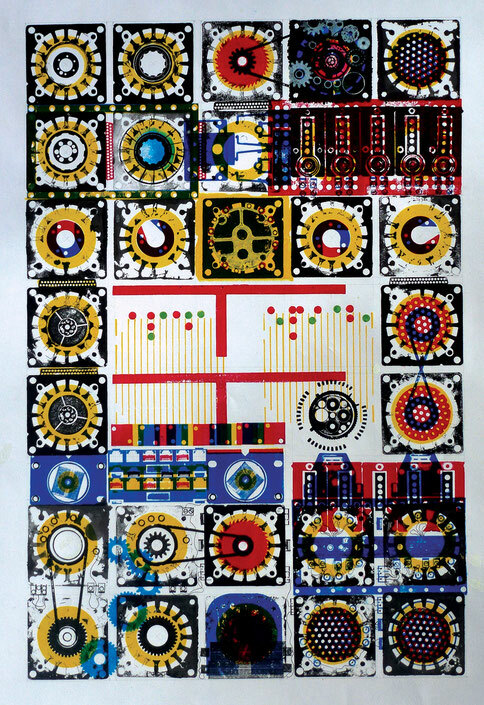 Printed matter Series 3 - De website van titusschulz-drukwerk! 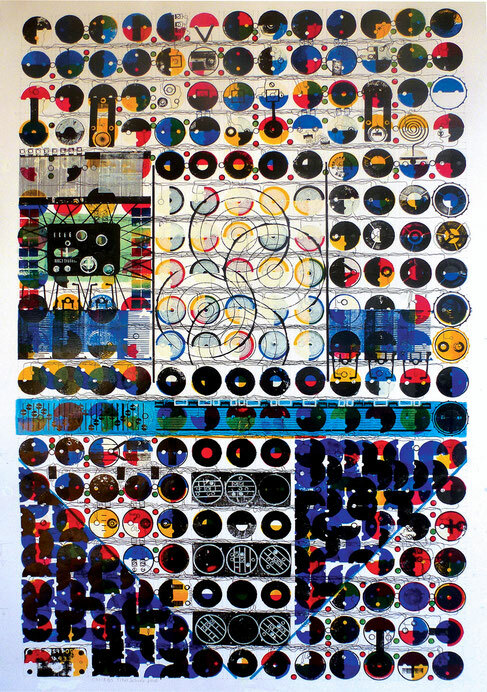 70 x 100 cm. 2015. Used materials: For example machine parts, corrugated cardboard and a serial plate of a WWII Flying Fortress. Switchboard. 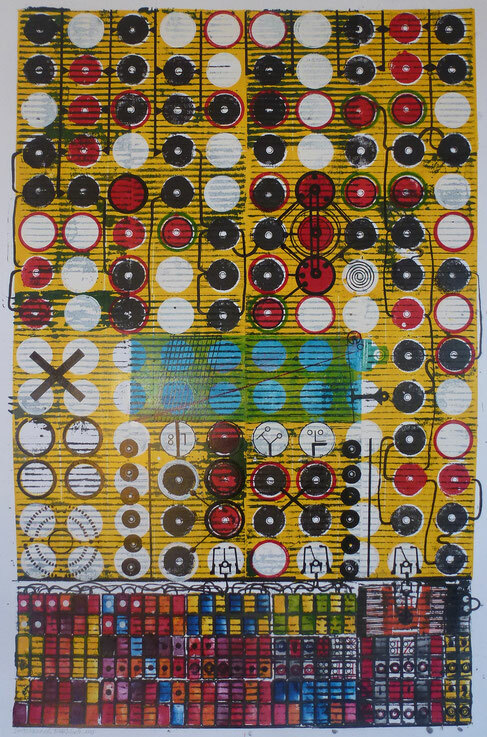 Blockprint with offset ink on paper, 70 x 100 cm. 2016. 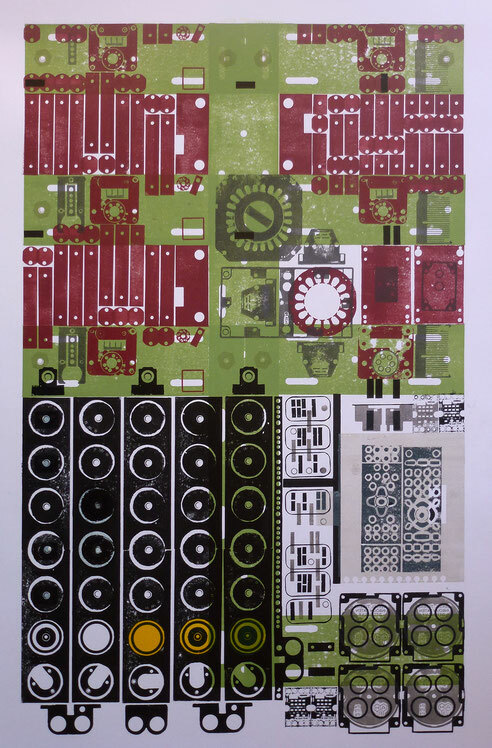 Used materials: For example linocuts, corrugated cardboard, WWII ammunition and electric plugs. Photographs. 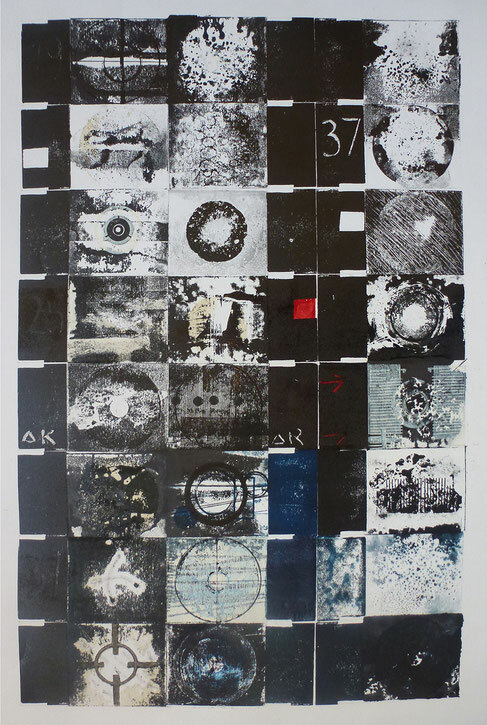 Blockprint with offset ink, plaster, carbon, cobweb and rust on paper, 50 x 65 cm. 2016. Used materials: For example linocuts, WWII ammunition (German and British), burnt matches and some machine parts. Used materials: For example machine parts, linocuts and electronical waste. CNIRBS Radio. 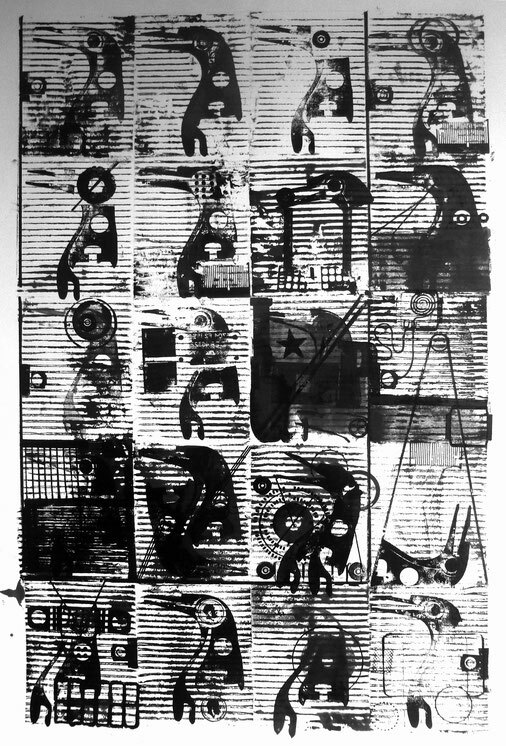 Blockprint with offset ink and drawings with black Indian ink on paper, 70 x 100 cm. 2016. Used materials: Electric plugs and machine parts. Machine 1. Blockprint with offset ink and drawings with black Indian ink on paper, 60 x 80 cm. 2016. Used materials: For example electric motor parts, a small circular saw and laboratory instruments. Keyboard. 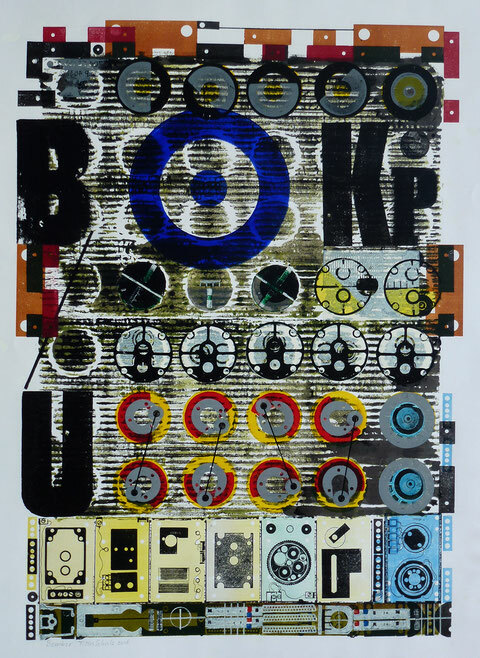 Blockprint with offset ink and drawings with black Indian ink on paper, 60 x 80 cm. 2016. Used materials: For example electronics and a computer keyboard. Bomber. 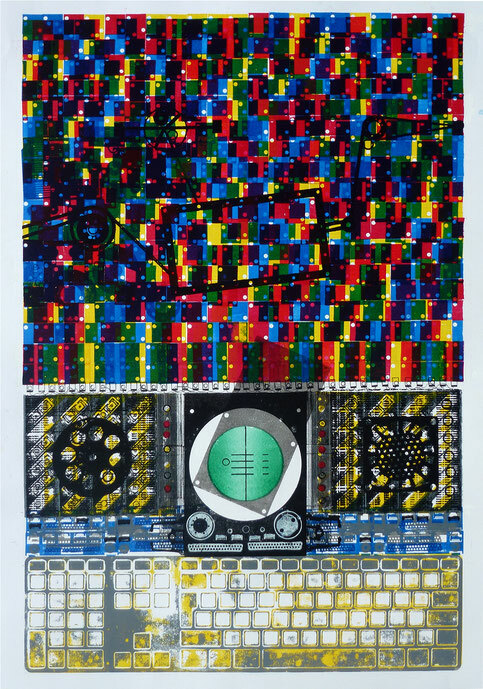 Blockprint with offset ink, ultramarine pigment and drawings with Indian ink on paper, 60 x 80 cm. 2016. Used materials: For example corrugated cardboard, wooden letterpress blocks and laboratory instruments.